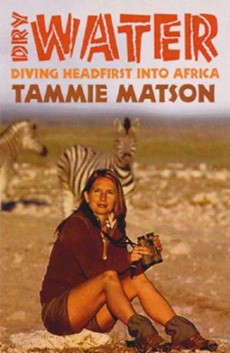 I love a family adventure…. I mean, let’s be honest, travelling with a rambunctious toddler in the far flung parts of the planet is not quite the same as when you’re travelling on your own. You can’t take the same risks and there are things like killer ants and venomous snakes to factor in. 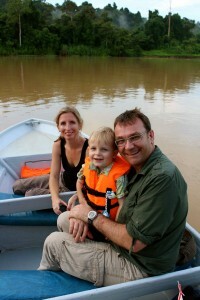 But there’s a lot you can do in the wild, as our intrepid son Solo taught us recently in Borneo. 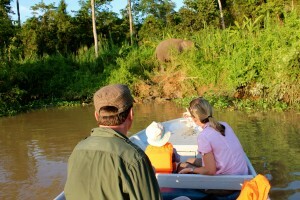 The Kinabatangan River in eastern Sabah is on the Malaysian part of the island of Borneo. Getting there is half the adventure. The small town of Sandakan is a 40 minute flight from Kota Kinabalu, after a 2 and a half hour flight from our new home in Singapore. It takes a couple of hours of driving on decent tar roads from there to reach the village of Sukau, and from there it was another 10 minutes in a small speed boat to our lodge on the river. 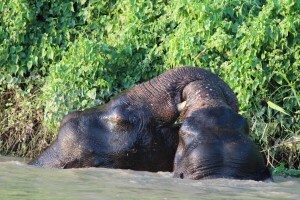 We had come all this way to assuage my long held desire to see a wild pygmy elephant before they go extinct. There are only a few thousand of this subspecies of the Asian elephant left in the world and they live in a world of human elephant conflict. Like their friends the orang utans that also live here, most of the habitat of pygmy elephants has been destroyed for palm plantations, to produce an oil that is in pretty much everything we buy at the supermarket, from packets of chips and vegetable oil to chocolates and shampoo. 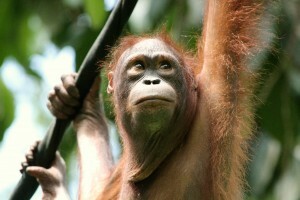 You’ve got to be a very savvy shopper to avoid palm oil as it’s usually not obvious. 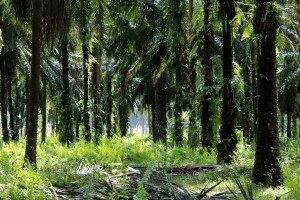 For a good source of information on how to avoid buying products with palm oil in them check out this website. Along the drive we realised that Sabah has significantly more bull dozers and diggers than it does pygmy elephants – by a long way. The monocultures of palm trees are simply everywhere in this country. Sadly, I realised soon after arriving that there was no chance of seeing a Sumatran rhino in the wild. There is a very small population in the Danum Valley, not far from the Kinabatangan River where we were based, but the rhinos are so few and far between there that they can’t even find each other to mate. In our hunt for the elusive pygmy elephants, we were fortunate to see wild orang utans, which was a real thrill, and the area’s famous proboscis monkeys, with their magnificent, huge noses. 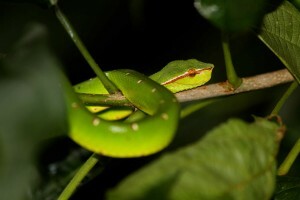 We narrowly missed running into a deadly Wagler’s pit viper in our boat one morning, which a herpetologist friend in Singapore recently told me was a good thing because in his words, “The best case scenario with a bite from a Wagler’s is you’ll lose an appendage”, before going on to explain how the venom basically eats away at your flesh within an hour of being bitten. Nice. That was the best case scenario. But for three days, despite the best efforts of our wonderful local guide, Sulaiman Ismael, the pygmy elephants proved elusive. It wasn’t until the very last day that Sulaiman and I found a bull on foot in the rainforest. Unfortunately he wasn’t as pleased to see me as I was to see him, and within minutes of finding him I was running for my life as he charged from ten metres away. Sulaiman, to his enormous credit, stood his ground and clapped and shouted to slow the charge, before chasing after me. It was not my proudest moment! If you would like to hear what a charging pygmy elephant sounds like, listen to this (I didn’t have time to turn off my video camera so this is the actual moment he charged). 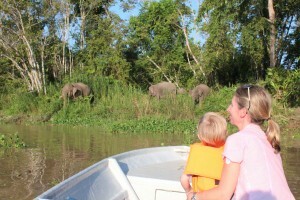 Later that afternoon, with Andy and Solo on board the boat, we finally found what we had been looking for… a huge breeding herd of pygmy elephants! The most striking thing about these elephants is that they are a lot smaller than the African species, and quite a bit smaller than the Asian elephants you see in other parts of Asia. 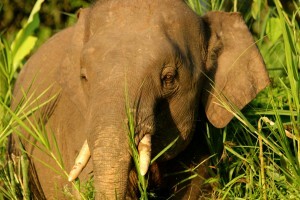 Male pygmy elephants rarely exceed 2.5 metres in height, compared to 4 metres in African elephant bulls. They have a heart shaped head and ears that are lower on their heads. If Africa’s elephants are the chocolate mud cake, then Borneo’s pygmy elephants are the chocolate eclairs – petite and pretty (I like to think in metaphors that involve chocolate, if you haven’t noticed). They are well worth a look, and if you can stand the high humidity and heat, (which has stopped me complaining about Singapore’s as it was just sooo much more extreme), this is a trip well worth the effort. Great memories for us and our little boy that we will treasure forever.